The idea for Saskatoon’s first makerspace began when co-founder Paul Chavady bought an Arduino and didn’t know how to use it. So, he did what any sane person would do. He started a makerspace so he could meet people that could help him out! The first meeting of the founding members was held January 11th, 2011. 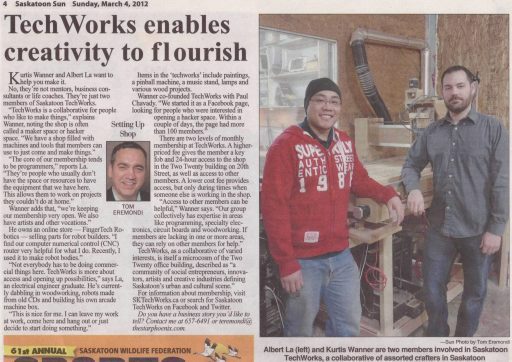 Saskatoon TechWorks Inc. was registered as a Non-Profit Corporation in the province of Saskatchewan on February 14th, 2011. The search for a physical location (shop) began. Saskatoon TechWorks opened our first shop in the basement at 220 20th St W. It was at this location that our members participated in a group build of quadcopters, and Goliath, our CNC Router, was built. By the summer of 2012 it was obvious we had outgrown our space at the 220. In October, we moved into our new space at 422 44th St E with about 880 square feet to spread our tools and benches. We continued to add tools at this location including a small laser cutter (40W 20cm x 30cm) two bandsaws, and a variety of electronics workbench tools including power supplies, oscilloscopes and a soldering station including a hot air wand. After an aggressive fundraising campaign, we purchased our first 3D printer in February 2013. Our Solidoodle 3 went through various upgrades, adjustments and repairs until it could make decent prints out of ABS. It is still functional today. With an almost 50% increase in membership, the shop on 44th was getting a bit cramped again. (Especially the front room.) Through a member’s employer, we were offered a larger space at basically the same rent we had been paying at 44th. Although our time at 422 44th was excellent and there is no better landlord than we had, we made the decision to move to 509A Gray Ave.
Coinciding with our move, we were made an amazing offer. Saskatoon TechWorks was offered the use of a large, powerful laser cutter. We wouldn’t own it, and the owner had first priority if there was ever a conflict (there rarely was) but we got the use of a 160cm x 90cm 150W Laser Cutter. Somewhere around this time we also received an indefinite loan of our second 3D printer. The Makerbot Replicator 2 is configured to print with PLA and turned out to be far less finicky than the Solidoodle. With the room available at this location, we were better able to host workshops open to the public, and started hosting a variety including Soap Making, PCB Design, Build a Larson Scanner, Laser Cutting Christmas Ornaments, and more. In 2016 we learned that the business we were subleasing from had purchased their own building. Our time on Gray Avenue was growing short. While there was no panic, yet, we started our search for a new location. Somehow, our old Landlord from 44th Street heard we were looking and called us up. After some significant and rushed renovations, we ended up moving into our current space at 412B 44th Street East. We now have over 1500 square feet of shop space on the main floor, plus about the same upstairs that is used primarily for members’ private storage. In November of 2016 we significantly improved our metalworking game with the acquisition of a 12″x36″ Metal Lathe. Six Years! We have been in operation for six years now. For some reason, our numbers were down at our weekly Hack Night on Feb 14th, so we celebrated after our AGM in March.